I'm getting ready for a solo exhibition at the gallery at Mercy by the Sea in Madison, CT which opens on February 28. I hope to have four new ones to share. One has the book completed, two have the pages stitched and the binding to go, and one is just beginning. All will still need bases to made and names to be given. If you're in the area, please come by if you can. 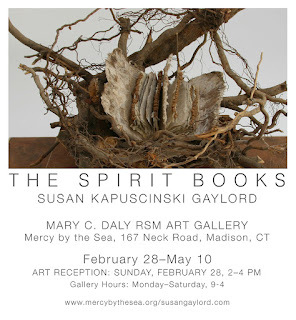 I'll be there for the reception on February 28 and the show continues until May 10. Here's a flyer. Feel free to share. Love the fact that there is an Altoids box in the bottom photo. Too good to throw out since it is a useful box for putting things in. I know, because I have one too!